When is it Okay to Visit a Children’s Dentist in Columbia? Are you afraid to visit the dentist? Imagine how a child might feel if mommy or daddy talks down about visiting the dental office. One of the best things you can do to ensure your child will have a healthy, beautiful smile is put your fears and apprehensions aside to bring your child to the dentist. Helping your child understand that their children’s dentist in Columbia is here to help them, not hurt them, is key to providing a stable oral health foundation for years to come. When should my child start visiting their pediatric dentist? Believe it or not, your child’s first dental appointment should be by his or her first birthday. According to the American Academy of Pediatric Dentistry, your child can begin having dental problems from the time their teeth begin developing. It’s always best to bring them in at an early age! Although you may not expect it, your child becomes susceptible to developing cavities as soon as their first tooth erupts. In fact, there has been a significant increase in preschool children with cavities according to studies. To be exact, about one in four children in the United States have had at least one cavity by the age of four! How can your dentist in Westfield help your child avoid tooth decay at an early age? By having your child visit your Indy Dental Group, you will know all the good things to eat, drink, and practice at home to keep their teeth and gums healthy. 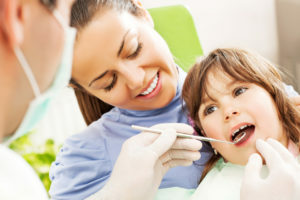 How can a children’s dentist help your little ones? Preventive Care is Super Important for Kids! It’s critical to your child’s health to keep and attend regular dental appointments! The fact stands that healthy baby teeth and gums create a sturdy foundation for adult teeth to develop into. This sturdy foundation also helps with developing your child’s bite, assist with chewing all of the new foods they’ll be trying, and speaking clearly. Their natural permanent teeth will have a much lower risk of having dental decay, cavities, and other severe dental problems when they develop with healthy gums. If you’re interested in scheduling your child’s first dental appointment, we encourage you to contact your dentist right away. When you choose to visit Columbia Healthy Smiles, you will be able to tell that we do everything in our power to take quality patient care to new heights—that even goes for the little ones! If you’re interested in personalized care and detailed patient education (for parents, too), then it’s time to give our Columbia office a call. Comments Off on When is it Okay to Visit a Children’s Dentist in Columbia?